I had a frank conversation with a Scientologist about religion. It was great! France has a long, fraught history with religion. Religion is a delicate topic. It needs to be treated with care and thoughtfulness, and the Museum of World Religions has done just that. I hate cold calling. Contacting someone you don’t know and soliciting an offer they may not be interested in. But that’s exactly what I did. I sent Dr. Potre Dirampatan-Diampuan an email asking if she would be available to speak about her experience as an interfaith peacemaker. Dr. D’s response blew me away. She not only made herself available to me but offered to plan an interfaith dinner to introduce me to several of her colleagues. She asked me for a date, called her friends, and made a reservation at a restaurant with a private room for us all to meet. And so on a rainy Sunday evening, Dr. D, six of her colleagues, and I gathered at a fancy Italian restaurant in Bonifacio Global City in Metro Manila. I was nervous, given that I had never met any of these women face-to-face and we would be discussing intimate topics such as faith, religion, peace, war, and violence. But as the women trickled in, they all greeted me warmly and conversation flowed naturally, as if we were old friends reuniting after much time apart. The six women Dr. D introduced me to were kind, welcoming, and intelligent. Between the seven of us, we represent Catholic, Protestant, Hindu, Muslim, and Baha’i faith traditions. Although we all have different experiences with religion and come from different ethnic backgrounds, we are united by our passion for interfaith cooperation. Each woman contributed a unique perspective in our discussion, yet seemed to be on the same page when answering my questions about the interfaith movement in the Philippines. I received the most interesting answer in response to asking the group if they could identify a specific success in the Filipino interfaith movement. Each of the women explained in their own way that success is difficult to quantify in this type of work. For how can one truly measure changes in peoples’ hearts? Of course there are lengthy sociological questionnaires and interviews that can be done, but those are often expensive and time consuming. However, the women agreed that since the September 11th attacks and the arrival of international terrorism to the world stage people in the Philippines are more open towards interfaith dialogue because of a “perceived need” for it. Following the creation of many grassroots Christian-Muslim peace organizations in the Philippines, particularly in Mindanao (Southern Philippines) at the advent and during Martial Law in 1972 and throughout the entire country since 9/11, there is now an even stronger sense of awareness of interfaith dialogue among Filipinos. However, when violence strikes the Philippines, there is a reflexive “return to fear — uncertainty” and interfaith dialogue loses popularity. And lately, the Philippines has gotten a double dose fear-inducing violence. President Rodrigo Duterte’s “war on drugs” has instilled fear in the guilty and innocent alike all across the country. Duterte has ordered his police forces to carry out executions of suspected criminals involved in the drug trade. These extrajudicial killings have numbered more than 7,000 since June 2016, with Duterte showing no signs of letting up (1). Because suspects are not arrested, given a right to legal counsel, or given a fair trial, the innocent are murdered alongside the guilty. The Philippines has long struggled with domestic terrorism, especially in its southern islands. Weak governmental control, rugged terrain, and a history of religious conflict between Christians and Muslims makes the island of Mindanao and islands in the Sulu Archipelago especially vulnerable to infiltration of militant groups (2). The rise of Islamophobia and gaining popularity of nationalist politicians in the Western world has also taken its toll on interfaith relationships and peacebuilding efforts. Dr. D. says that sometimes it seems like for every ally the Muslim community makes, they make ten enemies. Misinformation, an unwillingness to learn about Islam, and a host of other factors contribute to the growth of Islamophobia as a global trend. But these interfaith women are strategically tackling obstacles of prejudice and ignorance by creating and implementing religious education programs for Filipino youth. Dr. Genevieve Balance-Kupang, an applied cosmic anthropologist, a trustee of Asian Social Institute and five non-governmental peace organizations, as well as the institutional researcher, teaches a course in introduction to world religions and belief systems at St. Paul College Pasig in Metro Manila. Her colleague and peace friend, Ms. Louniza Napay, has taught in both the grade school and high school departments at St. Paul College Pasig for 30 years. Dr. Shakuntala Vaswani, a former botany professor, has been instrumental in creating and facilitating classes which teach both Hindu youth living in the Philippines about their own religion and educate non-Hindus about Hindu religion and culture in order to combat prejudice against Hindus. Dr. Potre Dirampatan-Diampuan, who is the United Religion Initiative’s Senior Interfaith Representative for the Philippines, also has extensive experience in both education management and creating peace education curriculum and works as a freelance lecturer. Dr. Marites Guingona Africa, is a lecturer on conflict transformation and Muslim-Christian dialogue at the Ateneo de Manila University and also works with grassroots organizations affected by conflict. Ms. Holly Grace Celeste was a technical educator for many years and also works with several Baha'i media groups in the Philippines. She also follows up with airings of radio programs on a community level, doing home visits and establishing classes which focus on moral education and transforming that knowledge into actions that serve local communities. As you can see, these women don’t just sit and talk about peace among religions, they are actively involved in building that peace from the ground up. Their intellect, commitment, and determination towards building a more peaceful Philippines is what gives me hope that a people living in country struggling with religious conflict, terrorism, and a militaristic government can learn to embrace their diversity and build a more peaceful future for their children. An earlier version of this article stated that Dr. Dirampatan-Diampuan was the Regional Coordinator in the Southeast Asia Region for URI. Her position has since changed and she is now the Senior Interfaith Representative for the Philippines at URI. Mr. Lwin’s humility pairs well with his wisdom. He is not poisoned with thoughts of seeking revenge on the government or extremist Buddhist monks who have been inciting violence against Muslims in his country. Instead, he looks towards the root causes of the rise of Buddhist nationalism in Burma. Tracing this misinformation regarding Islam back to the 1962 military coup lead by General Ne Win, Mr. Lwin claims that distorting the religion of Islam and twisting historical facts was part of a calculated plan by the military to gain popular support and was crucial to the success of the coup. Since then, Buddhist nationalists have been citing the historical decline of Buddhism and subsequent rise of Islam in parts of Southeast Asia as evidence that Islam is an unrelenting threat in the region. These are what Mr. Lwin calls dangerous “half-truths.” He explains that, for instance, the decline of Buddhism in parts of Afghanistan and Bangladesh began centuries before the Prophet Mohammad was even born and thus before Islam even existed. “Half-truths are very, very dangerous. More dangerous than fabricated stories,” Mr. Lwin says. And when these half-truths become embedded in the culture and the psyche of the Burmese people, the spirit of tolerance dissolves. RfP Myanmar promotes religious education for children so that they can arm themselves with knowledge in the face of the onslaught of propaganda and "half-truths." The Interfaith Youth Network at RfP Myanmar advocates for peace building through organized activities and hands-on learning such as visits to religious sites and volunteering in local HIV/AIDS centers. They also teach youth about the electoral process in Burma, civil society, hate speech, and nutrition. RfP Myanmar is also on a quest to remind people that in times of conflict, those most vulnerable are women and children. RfP’s Women of Faith Network is a diverse action-oriented group of women working to advance women’s involvement in the peacebuilding process as well as promote gender equality and prevent domestic violence in Burma. 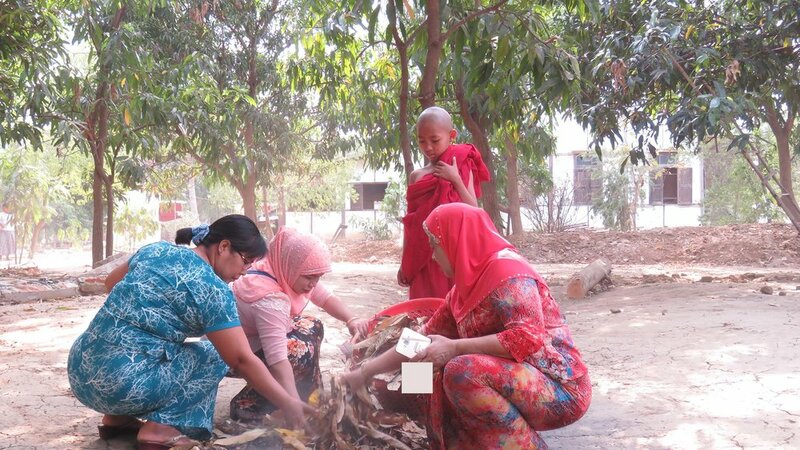 This year, the Interfaith Youth Network and Women of Faith Network joined forces to organize an interfaith event in Meikhtila, Burma to help clean up and plant trees at a Buddhist monastery where 800 Muslims sought sought refuge and were protected from violent mobs in March 2013. These kinds of activities are crucial to the peacebuilding process in areas with a history of violent religious conflict, like Meikhtila. Mr. Lwin’s mindset is equally as impressive as his work with RfP Myanmar. Recognizing the importance of inner peace, he says, “It’s no use talking about peace if your heart is heated with fire.” It is easy to tell that Mr. Lwin’s heart is not heated with fire at all. He takes special care to separate the perpetrators of intolerance and violence towards Muslims from their faith tradition, Buddhism. “I say often that in our country, religion has been hijacked.” Mr. Lwin recognizes that the hateful words and actions of extremist Buddhist monks in no way accurately reflect the values of the Buddhist faith. He is not bitter towards Buddhists or Buddhism in general. He even goes as far as saying that if true Buddhism prevails in Burma, the whole country will flourish, explaining that true Buddhism promotes tolerance and peace. Judging from the current state of freedom of religion and the persecution of Muslims in Burma, it is clear that the country needs more men like Mr. Lwin. People who understand the complicated history of their country. People who constantly search for the truth. People who positively seek change in their communities. People who aren’t blinded with hatred and anger. People who seek peace within themselves. People who never stop seeking peace for others. These are the opening lines to a speech made by extremist Buddhist monk Ashin Wirathu that was uploaded onto YouTube in March 2013. This is what people like U Myo Win, an interfaith leader and educator in Yangon, are up against. But before I tell you about Mr. Win’s work, I’ll relay his take on how things got this bad in his home country. Although Mr. Win does not claim that the military government and Buddhists are conspiring together to target Muslims, he highlights the intertwining roles of the two establishments. Mr. Win posits that the military needed a diversion in order to effectively take control of the country several decades ago. Muslims became the diversion and unfortunately the subject of much discrimination by the new government. Mr. Win says that Buddhist monks and authorities are able to continue the military’s job with spreading anti-Muslim rhetoric by making emboldened claims that Buddhist religion, culture, and way of life are at risk of extinction due to “Islamization.” Despite the fact that Muslims comprise only 4% of the Burmese population, they do not hold important government positions, and that the building of new mosques is illegal, Buddhist extremists have managed to convince a large portion of the Burmese population that the country is truly at risk of becoming a Muslim majority country. Why did the government need such a diversion? Because when they came to power, they requisitioned businesses, natural resources, and other sources of income in the country from the Burmese people. So instead of directing their anger and indignation at the government, many Burmese began to direct it at Muslims, with Buddhist monks fanning the flames. Anti-Muslim sentiment and fear of Islamization is promulgated by various sources of propaganda throughout the country. The inflammatory speeches of prominent Buddhist nationalist monk Ashin Wirathu can be found on YouTube and Facebook, which also serve as a platform for his followers to engage in hate speech against Muslims. Leaflets are distributed to villages claiming that Muslims are systematically purchasing land under false names with money given to them by the Saudis, that Muslims have “heinous plots” to take over the country, and that parents must teach their children to not communicate with Muslims or buy goods from Muslims stores or their entire nationality will be at risk. The effect of the propaganda is magnified by the fact that Burma’s education system vehemently discourages critical thinking. U Myo Win describes education as “copy and paste, listen and repeat.” Analytical skills are not taught in school. This means that from a very young age, Burmese children are taught to believe everything they hear from authority figures, like the government or Buddhist monks, without questioning. So how has Mr. Win been able to educate over 4,000 community leaders about interfaith cooperation in such a hostile environment? It’s simple: he disguised it. Calling his courses “civil engagement training" and selling them as service learning was the key. But it’s not as if Mr. Win is lying; interfaith leadership at its core is civil engagement — coming together to promote sustainable social, economic, and educational growth within the community. Founded by Mr. Win in 2008, the Smile Education and Development Foundation is a non-profit based out of Yangon, Burma "dedicated to eliminating poverty and unjust living conditions, and to developing responsible and productive citizens.” They use education as a means to create and encourage community leaders to be effective change-makers. In 2014, the Smile Education and Development Foundation organized the Interfaith Youth Tour, and were able to call it just that. Students from Buddhist, Muslim, Christian, Hindu and Sikh faiths traveled to seven different cities in Burma, visiting over 40 religious sites and engaging with over 60 religious leaders from different faith backgrounds. Bringing children together for experiential learning and unbiased religious education is a crucial step towards undoing the effects of years of hate-inspired propaganda. As a follow up to the Youth Tour, Mr. Win created the Interfaith Youth Services project, which asks those who participated in the Tour to commit four weekends in which they will plan and conduct service projects for different religious institutions. The goal of the project is to cultivate an interfaith network among students, while engaging them in humanitarian projects. In addition to working with youth, Mr. Win is also reaching out to more moderate Buddhist monks in the country. While some of them are receptive to his message of interfaith cooperation, many are still skeptical. But it’s a start. Mr. Win’s interfaith work speaks for itself — he is a fearless leader, bringing an unpopular message to people in a hostile environment. Perhaps what makes him so brave is the fact that he grew up as a Muslim in an entirely Buddhist community. Nearly all of his friends were Buddhist. Out of 1,000 students at his primary school, Mr. Win was one of only two or three Muslims. But his status as a religious minority never stopped him from being class president and a motivated student leader. His motivation would take him all the way to York University, where he studied conflict resolution on a grant from the UK government. And because he believes in the power of the interfaith movement, Mr. Win brought that education back home to Burma. When asked what total religious freedom would look like in Burma, he said, “We would have the freedom to do daily religious practices and right to celebrate out beliefs.” That means that people would be able to the gather in churches and mosques for services, wear religious garments, and speak freely and proudly about their religious beliefs without fear of retribution. While Burma is surely a long way from achieving this, Mr. Win is optimistic because at their core, these feuding religions have similar values when it comes to peace. “[True] Islam is encouraging peace. Islam is encouraging harmony in society. The Prophet Muhammad said you have to practice the middle way. That’s very similar to Buddhists.” He says that there is no “other” in true religion — there is no “them versus us,” no “owner or guest” of a single religion. Win can recite Buddhist and Islamic scriptures that call for peace and tolerance, and they sound quite similar. And so in Burma, despite the deplorable state of religious freedom, despite the propaganda, despite the persecution, there still is faith in faiths.